The Philadelphia Asian American Film Festival presents free screenings and programs in ICA’s Tuttleman Auditorium, as part of their 2018 Festival Program. For more information and to register for these events, please visit the Philadelphia Asian American Film Festival website at https://phillyasianfilmfest.org/. Drawn Together: Comics, Diversity and Stereotypes follows the journey of three talented artists as they use comics and cartoons to challenge racial, religious, and gender stereotypes and inspire others to breakthrough socially and self-imposed limitations. Keith is an African-American syndicated comic writer who tackles police brutality and racial injustice with satire. Vish is a Sikh-American who proudly wears his turban and beard with the Captain America uniform to challenge our idea of what a superhero should look like. Eileen is a white woman who confronts gender bias and traditional norms of femininity with strong female characters. Drawn Together film taps into the public’s endless appetite for superhero stories to refocus common comic themes of justice and doing good for the community in order to open a deeper and more inclusive social dialogue about identity, respect, and representation. By channeling questions about how we view ourselves and others through a creative medium, the viewer is able to confront prejudice and stereotype in a low-risk way. Documentary subject Vish Singh expected in attendance for post-film Q&A. Futbolistas 4 Life is about Oakland teens from Latinx immigrant families and the healing power of soccer. The film takes you into the lives of two high schoolers: one is a college hopeful and DACA applicant navigating the reality of his immigration status, and the other is an American citizen afraid that her undocumented parents may be deported. These youth take solace in the game of soccer, which lets them put their worries on the sidelines, if only for a moment. Futbolistas 4 Life sheds light on the overwhelming stress experienced by immigrant youth living in communities with high rates of poverty and violence, communities increasingly in the crosshairs of federal immigration policies. The film captivates viewers with its compelling characters, cinematic footage, carefully crafted animations, and beautiful score by Grammy Award winner Adrian Quesada. Filmmakers expected in attendance for post-film Q&A. Co-presented by Philadelphia Latino Film Festival. What do a street dancer, violin virtuoso, keeper of sacred tradition, and femme-forward hip hop artist-activist all have in common? Their love of music. This mixed block of two narrative and two doc shorts explores a few of the many different relationships that people have with music, and the impact it has on our lives. 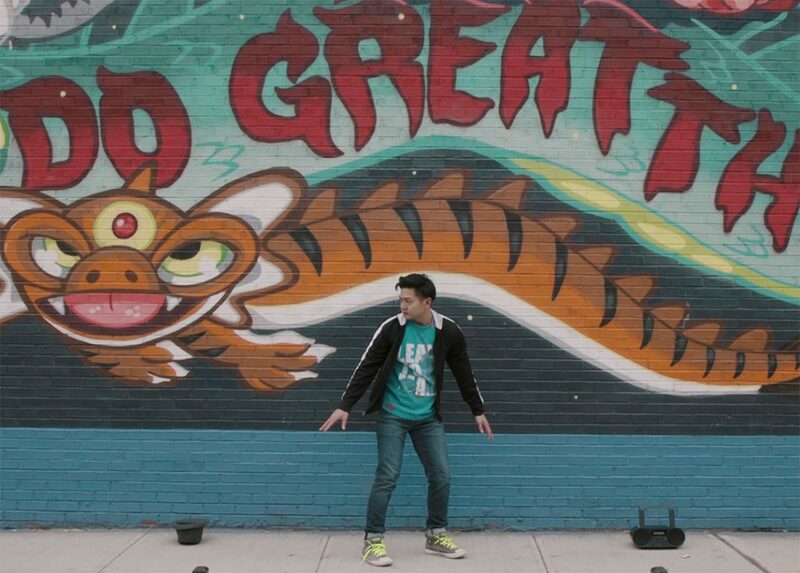 A young street dancer’s life is changed forever when his mom gives him a magical pair of shoes. Two Chinese immigrant half-brothers audition for the same prestigious film role. In a vicious effort to win the role, the elder brother stealthily sabotages the younger throughout their audition process. Besieged vividly depicts the darkness of jealousy threaded within sibling rivalry. This short documentary captures the essence and spirit of Sattriya – a five-hundred-year-old living dance tradition from the Vaishnav monasteries and the story of Assamese monks that live on the river island of Majuli. This behind-the-scenes documentary records Pinay Rapper Ruby Ibarra as she makes her directorial debut for the music video of “US”. Working through logistical nightmares and corralling a crowdsourced all-Pinay cast of 200, the film shows how she executed an ambitious vision to create a compelling multi-dimensional narrative about resistance, solidarity, and female empowerment. Caridad Amaran and Georgina Wong learned the art of Cantonese opera in 1930s Havana. Caridad’s mentor was her foster father, Julian Fong, who immigrated to Cuba in the 1920s after his family forbade him from performing opera. Georgina’s father was a famous tailor in Chinatown, who encouraged her to learn Kungfu and lion dance. Although each was an only child, they formed a sisterhood on stage. Throughout the 1940s, Caridad toured cities with Chinese communities all over Cuba as one of the lead actresses of the opera troupe. Georgina quit opera to attend college, but her study was interrupted by Castro’s 1959 revolution and her required military service. Eventually, she went on to become a diplomat. After retirement and well into their sixties, the two “sisters” are trying to perform Cantonese opera again. Will they find a stage? Will they find an audience? Film will be introduced by Nancy Yunhwa Rao of Rutgers University. How can Non-Western music and dance be preserved and practiced in a way that honors social-politico-historical contexts and cultural identity? Should we avoid transactional learning experiences when music and dance is traditionally part of the lifestyle, not a performance? When can “cultural art” enter the Western realms of “high art”? Does the meaning of traditional music and dance change when practiced by diaspora and outsiders? These are all questions Sining Kapuluan, a Brooklyn-based educational arts group, focuses on when learning and performing music and dance inspired by traditional Filipino culture. The Philippines in particular has a complicated history of colonialism, war, and political unrest. Yet, her culture is rich with beauty. In a country consisting of over 7,000 islands, there are areas with music and dance practices that have survived the many changes and continue to be practiced today. A growing community of Filipinos and Filipino diaspora want to keep these traditions alive—including Sining Kapuluan. Sining Kapuluan traces their roots to 2nd and 3rd generation Filipino and Filipino American artists in the San Francisco Bay Area who have learned directly from masters in Maguindanao and Cotabato. The group’s repertoire incorporates kulintang, dabakan, gandingan, malong, pangalay, and much more. Sining Kapuluan will share their distinct learning process, and talk about their individual journeys in the arts and identity exploration.